In January of 2014 I sat having a coffee with a photographer friend of mine Justin, musing, as we tend to do, about or respective photography meanderings. These discussions are characterised by melancholic self-criticism usually countered by the other party offering suitable words of encouragement. The gist of my utterances were that I had grown a little tired of my scattergun approach, flitting to locations on a whim of the weather or reacting to photographs from others that I wished to emulate. Despite enjoying many good outings in my formative photography years, during which I had learned a great deal about technique and had also created many pictures that, to this day, I'm very happy with, I felt that a change of approach was needed if I were to progress my appreciation of the landscape - and therefore my photography. Then one of us said "I think what I might do is just spend the whole year photographing in one location, like Thirlmere, for example." Surprisingly I realised it was me saying those words. I'm not even sure where that came from, I mean, somewhere in the back of my mind that thought had occurred but it was by no means a fully formed, or even thought out, opinion. But as I offered those words I quite liked the sound of what I was hearing. And thus the initially entitled 'Tapestries of Thirlmere' began. Maybe one day my thinking will have developed enough to define a brief before starting a project but when I started this one I had no concept of where the project would go, beyond defining the location. The only tenuous reason as to why I thought about Thirlmere was simply that it was, in comparison to the main Lake District photographic hotspots, relatively little photographed. I think that was it! I must confess that I didn't know whether I'd stick to the plan, however, possibly due to making some of my most original images (like 'Overflow' or 'The Dancers II') within the first month of starting the project, I managed to get some personal motivation momentum. As the months went on I found I was getting to know various places quite well, yet I had a pervasive feeling that I was only scratching the surface too. Typically I would venture out with no agenda other than to meander for 2-4 hours, sometimes just within a very confined space, other times taking in a view from the overlooking fells. As the weeks went by it was impossible not to be struck by some of the historical features of the landscape, whether that be the moss covered remains of an old farm building by the shoreline or the eerie feeling of standing on one of the islands that had become accessible due to the low summer water levels. I'd come to realise that during over fifty visits over the year that I now felt a connection with the Thirlmere landscape. The rise and fall of the water levels, over 6m difference over the year, creates an ever changing shoreline and on occasion (particularly off Deergarth How Island) it felt like "scuba diving without the water" as another friend of mine, James, put it. 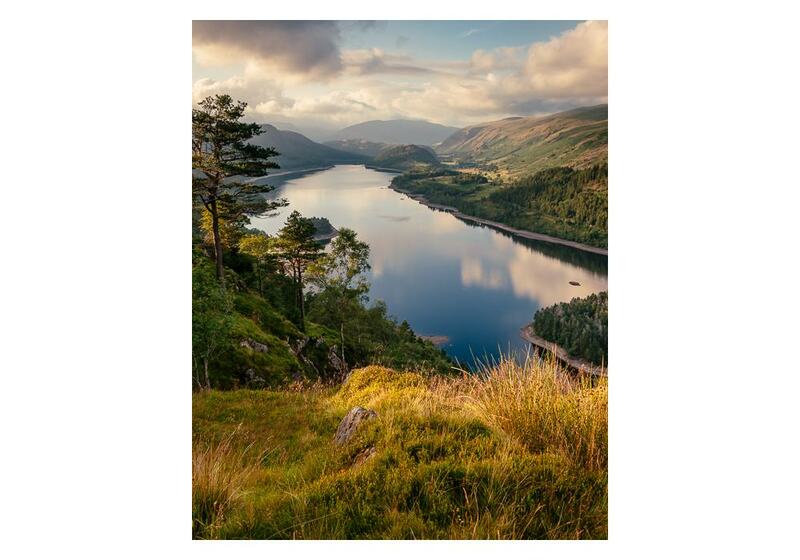 By October I had an interesting collection of photographs tentatively titled 'Tapestries of Thirlmere" yet I was struggling to reconcile the theme in my own mind; I needed to develop my thinking along with developing my photographs. I'd made an image during the summer called "The Tottling Stone" (also known as Tottering Stone or Rocking Stone), taking in the view north towards Great How and Blencathra but also featuring a great stone teetering, seemingly precariously, on the edge of a steep drop. Researching this stone I came across the same photographic view by an Ambleside photographer, Herbert Bell, but from the late 1800s prior to the building of the dam and the subsequent joining of the two bodies of water known as Leathes Water and Wythburn Water. 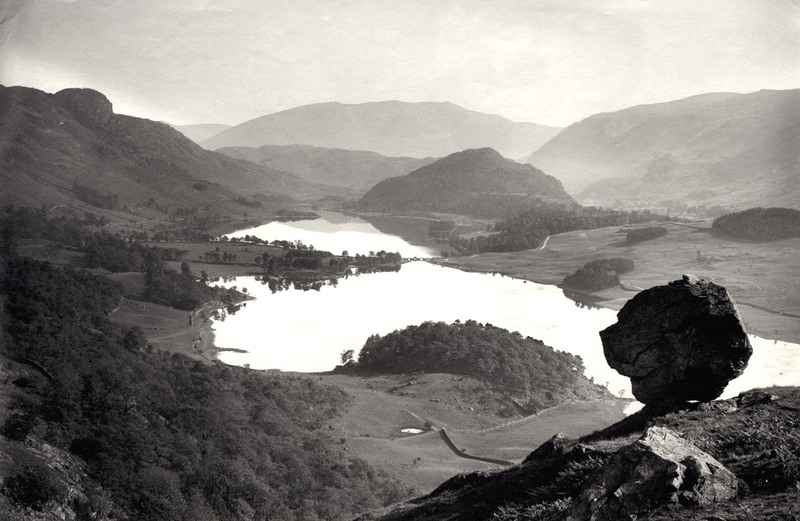 I discovered that the Armitt Museum in Ambleside owned the complete collection of Herbert Bell's various photographs and also they had a copy of the definitive documentation about the creation of Thirlmere "History and Description of the Thirlmere Water Scheme" Sir John Harwood. I scheduled a visit to the museum and spent a few hours perusing these documents. To say I was enthralled is an understatement, not just the enchanting early photographic records of the area but the cultural background detailed in the Harwood book took me completely by surprise. To see fascinating (and in some cases completely hilarious) anecdotes from the preparation of the scheme alongside technical drawings and scientific analysis was an intoxicating combination. The book documents everything, from the geography and geology of the area to the costs associated with acquiring all of the land and businesses in order to solve the growing requirements of an industrial Manchester. Of course there was opposition to the scheme by many and approval was fought through to the highest levels in London. It can certainly be said, with a significant amount of evidence, that the proposal to flood one of the most picturesque areas in the country in order to support the industrialisation of the cities created the first organised campaign on environmental grounds with the formation of the Thirlmere Defence Association. Alongside the well constructed environmental arguments the campaign attracted some more cultural words that speak very clearly of the sacrifice about to be approved by Parliament. Sonnets, such as Thirlmere Loss and Gain by Rev H D Rawnsley and The New 'Paradise Lost' an eighteen page poem addressed 'To the people of England' particularly struck a chord (copies available at Armitt and also the National Trust property at Townend). We can never experience the area as it was then, except through Herbert Bell's (and contemporary's) pictures and through the eloquent words of the cultural writers of the time. Yet we can experience it as it is now, an ever changing tapestry of Lake District landscape. Paradise Lost? Nature can adapt to change of course and this exploration is in some way a study of that, if only skin deep. Look beneath the skin though; the cultural landscape that was destroyed and of course the lives that were irrevocably changed when the inevitable land purchases were made to ensure the reservoir could be built. For those, of course, this was paradise lost. "Paradise Lost?" a photographic exploration of Thirlmere is a continuing project with selected images found here.